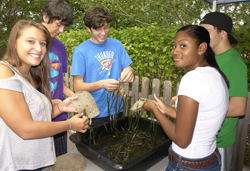 The success of the Marine Meadows Program is reliant upon community member participation; we cannot accomplish the goals of this program without your help! You can get involved as an individual by participating in one of the events offered in your area. Most Marine Meadows workshops are open to the general public, regardless of the venue (some events are not open to the public and these will be indicated). Workshops open for general registration, in addition to those being held exclusively for membership of a given organization or group, will be posted on our Facebook page on the wall as well as within the “events” calendar. Here you will find the most recent information pertaining to workshop schedules and other Marine Meadows related information. We also invite you to join our informational email distribution list which will also allow you to stay informed about the Marine Meadows Program. 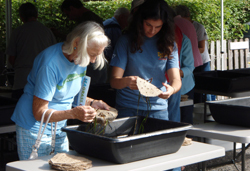 By participating in a Marine Meadows Workshop, you will be actively making a difference in restoring marine habitat in our local waters. 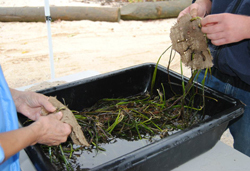 Public involvement allows us to greatly expand our restoration efforts in a way that can lead to establishment of more marine meadows in our estuaries. So please do consider becoming an active participant in the Marine Meadows Program! Although SCUBA diving is an integral part of almost everything we do in the Marine Meadows program including both collecting and planting of shoots used for restoration, we are sorry to say that at this time we cannot utilize SCUBA volunteers for our program. 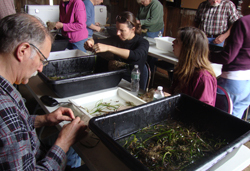 All divers taking part in our work are employees of Cornell Cooperative Extension.